I’ve only seen about half of the first Mission: Impossible, haven’t seen the second one (which is reputedly bad?) and though I did watch the third installment I don’t remember a single thing about it. Really. Except that Tom Cruise was in it. So going into MI4 was a bit like seeing any of the MI series for the first time. I wasn’t sure what to expect, only that it ought to be decent at the very least since Brad Bird (Iron Giant, The Incredibles) was at the helm and Michael Giacchino was providing the music. 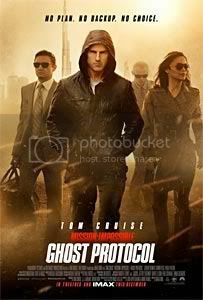 IMDb sums up the story in one sentence: The IMF is shut down when it’s implicated in the bombing of the Kremlin, causing Ethan Hunt and his new team to go rogue to clear their organization’s name. The storyline is predictable, but the action is clearly the main draw. You have Tom Cruise in all sorts of death-defying situations (the one that sticks out the most is probably the bit where he’s climbing the Burj Khalifa), typically super hi-tech gadgets (gloves that allow you to be Spider-man, contact lenses that are like a computer or camera superimposed onto your eyes, magnetic field-generating robots that make a person float, etc.) and crazy chase scenes (a chase through a sandstorm in the middle of Dubai, a chase in an impressive-looking parking lot in India – wonder if that really exists – and so on). I think that compromise between story and action works. If you have a complicated story with complex action set-pieces all over the place, it might be a bit of an overdose and difficult to follow, but simplify the story and ramp up the volume of the action and the whole thing balances out. Brad Bird did well there. I thought the cast worked well together – Simon Pegg’s Dunn was funny, Tom Cruise was Tom Cruise and Jeremy Renner was pretty good as the initially uptight analyst Brandt. Paula Patton was the prerequisite female character and in a sense didn’t have as much to do. I’m not sure I liked how she was always so emotional in comparison to her other teammates, and though yes, women are more emotional than men, her tendency to react ’emotionally’ didn’t feel quite in step with her role as a secret agent. E.g. nearly messing up the whole thing with Brij Nath (Anil Kapoor) because Brandt was in a precarious position. I would have expected a little bit more self-control from someone trained for covert ops and such. My friends pointed out that the various location scenes were rather stereotypical. They go to Dubai, you see camels and sandstorms. They go to Mumbai, and you have a mass of people and traffic jams. While that’s true, I wasn’t bothered by it. These days big cities the world over look almost exactly the same, so without the visual ‘stereotypes’ I think such locations (in movies) would lose a bit of character or charm. To conclude: MI4 was a fun watch – a pretty good first movie of the year.